Whenever we come across the term “Meditation”, we normally think about the Buddhist monks or Hindu sadhus/rishis who are in their distinct saffron clad robes sitting with serene peace under a tree. Even Buddha is portrayed in the same way to the world. So why is meditation related to monks/sadhus? or Does it have any religious connotation or connection to Hinduism/Buddhism? There is no doubt that the origin of Meditation is linked to ancient India which goes back thousands of years preceding Gautama Buddha’s Birth and Enlightenment. Many forms of this “Meditation” have evolved over the centuries and have spread to the different parts of the world with the spread of Buddhism. Unlike the general perception, it is not always related to worship or devotion. The West got the first glimpse of Meditation in an official representation during the World Parliament of Religions which was held in 1893 at Chicago. Many speakers like Swami Vivekananda and Buddhist scholars toured America and opened centers where local populace could come and engage with the inner-self. There should be some rationale to back it other than some historical claims, right? As technology has been able to keep us connected 24 x 7 and with answers available to a lot of questions via Google at our fingertips, there is a paucity of the realization of who we are and what we need. We are at a breakneck pace to outsmart a narrative which is being set by the societal norm rather than by ourselves. So, How do we know more about self? Apart from the philosophical reasoning, there are some scientific facts as to why people can think of meditating. I would list them down and let you guys make a decision based on it. As usual, before delving into any topic, we should know the basics. So let us go step by step to have a better understanding regarding Meditation. The brain is composed of several electrically excitable cells called neurons and several other structural support cells called glia. Glia cells act as a support to the neurons and help to clean up the cellular debris. Activity in the neurons causes waves or rhythms to be are generated by the brain when activity in these cells happens. This activity produces electrical pulses which are measured using sensors placed on the scalp or on the brain directly. The device used to detect these electrical signals is called as an electroencephalogram better known as an EEG. Brainwaves are essential for learning and for other processes involving communication between different parts of the brain. As seen from the figure below, the brain waves vary in frequency (Hertz) and strength (amplitude). Higher the frequency, lower the amplitude. This continuum is divided into “bands” and labeled as we see below (cps is short for cycles per second or Hertz/Hz). Now after knowing the basics regarding the brain waves, we can see that based on our actions our brain waves change throughout the day or during the time that we sleep. With regular Meditation, a boost in Theta and Alpha waves are observed in person’s EEG. 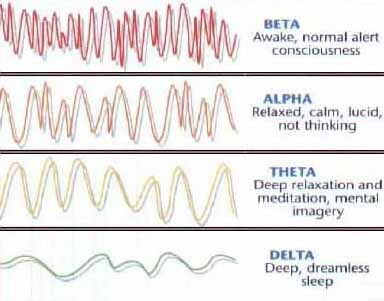 Theta waves depict the Deep Level Meditation whereas Alpha waves the Mindful Meditation. This means achieving a state of relaxation is possible depending on the depth of Meditation. Biochemists and molecular biologists have looked into the indicators of meditative effects through what is called as biomarkers. Biomarkers are naturally occurring molecules, genes etc. by which a particular pathological or physiological process, disease, etc. can be identified. Gamma-Amino Butyric Acid(GABA) is an inhibitory molecule that slows down the firing of neurons and creates a sense of calmness. Deficiency of GABA causes issues like anxiety, nervousness, racing thoughts, and sleeplessness. Studies have shown that Meditation increases Gamma-Amino Butyric Acid (GABA) levels that have a central role in cortical inhibition (CI), modulating cortical excitability and neural plasticity. Serotonin is a neurotransmitter which regulates the mood, appetite, and sleep. This is increased in meditators which may be read positively since depressed patients showed much-decreased serotonin. 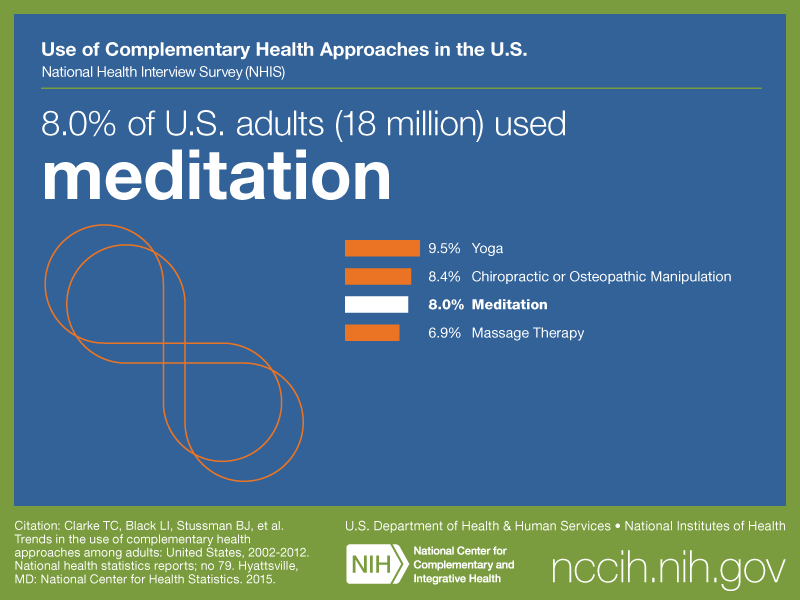 Currently, Meditation is being used as a non-pharmacological approach for mood improvement[. Cortisol is a steroid hormone that regulates a wide range of processes throughout the body, including metabolism and the immune response. It mainly helps the body respond to the stress. Irregular levels are observed due to physical or emotional stress levels and in some cases due to some illness. Patients having irregular levels of the hormone are found to have decreased stress levels post Meditation. Meditation helps with emotional stability and managing the stress because it helps maintain calm and stable mental states even when presented with potentially distracting stimuli. Studies have shown that brain signaling increases in the left side of the prefrontal cortex, which is responsible for positive emotions, while activity decreases on the right side, responsible for negative emotions. Research from the University of Kentucky shows that Mediation improves the sleep performance of people who have just started Meditation. In a surprising contrast, expert Meditators needed fewer hours of sleep to work efficiently. The topic is being further investigated. Meditation helps to become self-aware and be conscious of our imperfections and accepting them as a part of ourselves. People meditating regularly are found to have higher ability to concentrate. MRI scans on people who have been selected in a sample pool for a study show larger grey matter concentration in the areas of the brain involved in cognitive functions. The latest study shows that long-term practice of Sahaja Yoga Meditation is associated with larger grey matter volume overall with regional enlargement in right hemispheric cortical and subcortical regions of the brain that are associated with sustained attention, self-control, compassion, and interoceptive perception. Meditation induces relaxation, which increases the compound nitric oxide that causes blood vessels to open up and subsequently, blood pressure to drop. A study published in 2008 in the Journal of Alternative and Complementary Medicine, showed that 40 of 60 high blood pressure patients who started meditating could stop taking their blood pressure medication. Another study published in late 2012 noted that meditation “significantly reduced the risk of mortality, myocardial infarction, and stroke in coronary heart disease patients. These changes were associated with lower blood pressure and psychosocial stress factors.” There are also other researchers pointing out similar conclusions, about related health conditions. Studies show that meditation changes in the brain physiology to slow aging. “Cognition seems to be preserved in meditators,” says Sara Lazar, a researcher at Harvard University. Lazar adds that meditators also have more gray matter – literally, more brain cells. A recent study which was done using machine learning found out that Meditators at the age of 50 were about 7.5 years younger to their contemporaries who did not meditate. After mindful meditation(behavioral training), self-control abilities and emotional control were found in people who were smokers in the latest study.